The 50 and 75 mm glass tape and wood flour showed up Thursday afternoon so I spent two marathon nights in the shop getting sticky. After more hours than my back was really happy to be on duty, I finally finished up last night. 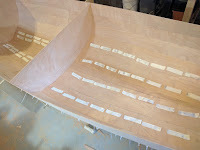 It's not that the work is difficult, but leaning over the gunwale of the boat, reaching down to spread out the seemingly endless supply of 180 mm fiberglass tape pieces just go old. I started out by measuring and cutting 100 pieces of 180 mm fiberglass tape from the 50 mm wide roll. I came to the the 180 mm number simply because the zip ties are spaced at 200 mm and 180 would give me a little leeway on either side (first pass lays the tape between the zip ties). Once cut, I vacuumed out the boat to get any debris out that would prevent the tape from laying flat. I layed out all the pieces of tape next to the spots they would soon occupy permanently and then it was just a matter of mixing up a batch of unthickened epoxy and painting in between the zip ties. I would generally paint out a row, going from the stern forward to frame 5 and then place and smooth out the pieces of tape in an orderly fashion. Then I would move onto the next row, do the same, and then circle back to the first row (which by that time had a bit of soak time), and brush a thin layer of epoxy over them to make sure they were fully wetted out. Repeat... again and again over the course of two days. 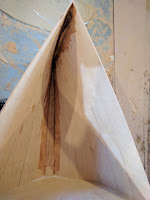 Once those were all done, I mixed up a batch of epoxy and thickened it to peanut butter consistency and spread it into the frames and transom; first with a putty knife, and then followed with my finger which is the perfect filet radius. After taking care of that, I cut a small piece of mahogany and planed it down so that it fit nicely in the inner stem to tie the strakes together. This isn't called for in the plans, but I can't see how it would hurt (other than add about 6oz of weight) and most boats do have this 'feature'. I fileted that in place and called it a day. This morning I woke up to a fine April Fool's joke complete with 10 inches of snow and the power out. Fortunately, the shop is well insulated and it only got down to the 40 degree F range. The power came back on this afternoon and I started working on the scuppered inwale that needs to go in place before flipping the boat over. This is also a deviation from the standard plan, but I know others have done this and I have found in the course of messing around in boats that scuppered inwales make nice places to tie something off anywhere along the rail of the boat. Very handy and I think it looks nice too. I have a couple of nice black cherry boards that I had bought for the gunwale/inwale job so I sliced off a few 3/8" (~10 mm) pieces and cut them to 2" (50 mm) lengths to use as spacer blocks. I marked out the placement and found that if I have the 50 mm spacer block spaced every 100 mm they will be nicely staggered the entire length of the boat. 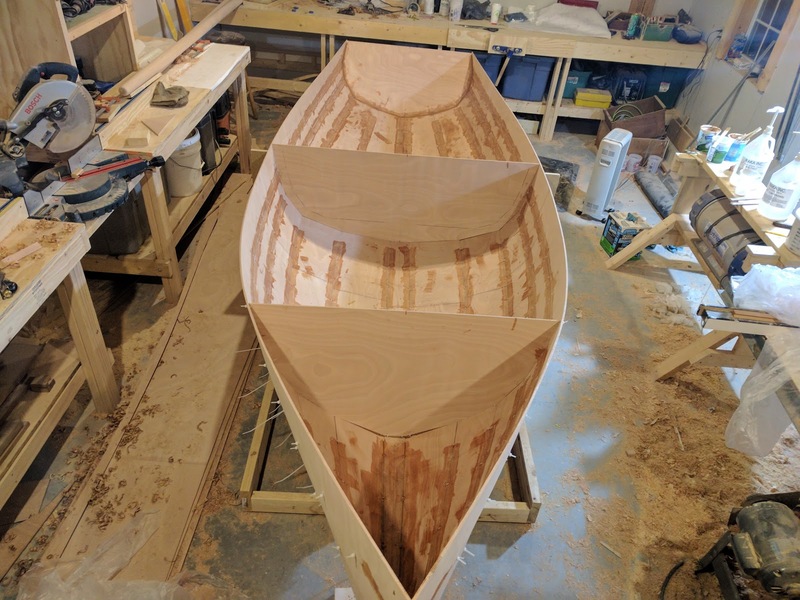 A note on the metric measurements: the plans are all metric and while I still have a little trouble visualizing how long say 125 mm is (whereas if I think about 5 inches, I can visualize how big that is), it is WAY better going metric. The math is dead simple and I wish all my tools were calibrated in metric. I did buy a full on metric tape measure and I have a metric straight edge that I've been using as well. I wish we could convert everything over. Anyway, I mixed up a batch of thickened epoxy and spread it onto each spacer block and positioned them with spring clamps. Unfortunately, the saying 'you can never have enough clamps' is very true in the case of doing scuppered inwales; I have about 20 or so, but probably need a good 30 to do one whole side (let alone the whole boat), so I did one 20ish clamp section and will wait till those kick before getting the rest of the side done before going to bed tonight. Glad to see you're still coming along strong! PVC pipe is the answer to your clamping needs. Get a good length of 6 inch diameter pipe,make a long cut along with a radius then cut the pipe crosswise into a bunch of 2 inch slices.. Voila! Cheapo C-clamps! Of course, use a table saw for this, elsewise you'll go nuts. Question, what's up with the midships bulkhead? Is it going to stay that way (seems inconvenient) or get cut into some sort of ribs? That's excellent, I know I've seen that before, I may have a piece of pipe that I can use. Thanks. As far a the bulkhead goes, it's hard to see in the pictures, but it is almost all cut out. I marked out the pattern and cut the majority of the wood out, leaving 3 inch tabs along the way that can be easily cut with a handsaw later when the hull has been stiffened up more. 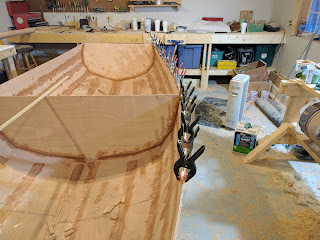 Keeping the middle section in place allows me to sight along it's top and center to make sure the hull has no twist. The forward bulkhead will probably have circle cutouts on either side of the mast, but I haven't determined exactly how big yet. Lots to be determined.